How Do I Create a Basic Histogram in Excel Using SigmaXL? Click SigmaXL > Graphical Tools > Basic Histogram. Click Next. Ensure that Normal Curve is checked. Set Start Point = 1. Change the Bin Width to 0.5, and the Number of Bins to 8. Click Update Chart to view the histogram. (If the survey satisfaction data was pure integer format we would have checked the Integer Data option). Click Finish. 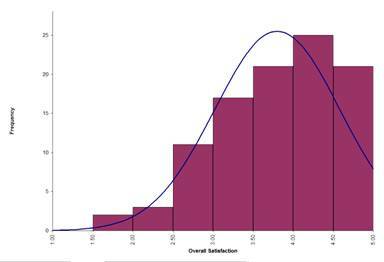 A histogram of Overall Customer Satisfaction is produced. Note that bin one is 1 to < 1.5, bin 2 is 1.5 to < 2, etc. Tip: Any graph produced by SigmaXL can be Copied/Pasted into Word. It can also be enlarged by clicking on the graph and dragging the corner. The number of decimal places displayed can be modified by clicking on the Axis Label and selecting the Number tab to adjust. The text label alignment can also be modified by selecting the Alignment tab.